Business Woman In Front Of Monitor's Computer (graphic designer, freelancer, architect, student or creative copywriter) working in her studio flat, loft or agency office. She has a perfect workplace: shelves with folders, lamp, huge pro monitor, computer and other creative tools needed. She is working for many hours and looks tired. She is looking closely at the monitor and watching what is happening on the screen. 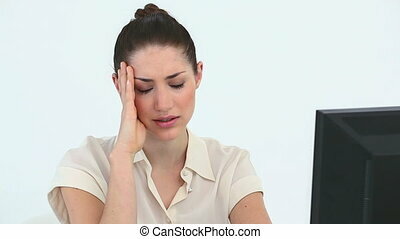 Young woman in front of computer screen. Dark night room. Beautiful young upsetting business woman sitting in front of laptop computer. Emotionally expression face, feelings, problem, perception, reaction. Young man in front of computer screen. Dark night room. Business Woman In Front Of Monitor's Computer (student, freelancer, graphic designer or creative copywriter) working in her studio flat, loft or agency office. She has a perfect workplace: shelves with folders, lamp, huge pro monitor, computer and other creative tools needed. 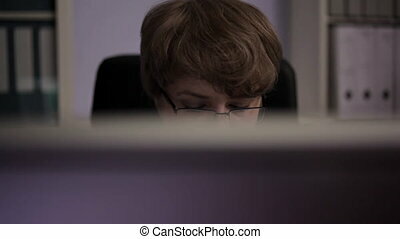 She is looking closely at the monitor and typing with the keyboard and clicking mouse. 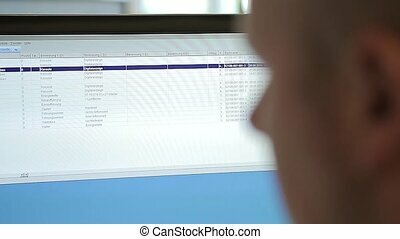 The work she is doing could be creative text writing, advertising idea description, financial calculations or entering information data. Business Woman In Front Of Laptop, Monitor's Computer(graphic designer, freelancer, accountant or creative copywriter) working in her studio flat, loft or agency office. She has a perfect workplace: shelves with folders, lamp, huge pro monitor, computer and other creative tools needed. She is looking closely at the monitor and watching what is happening on the screen. creating charts or content for the company's advertising idea description, financial calculations or entering information data. 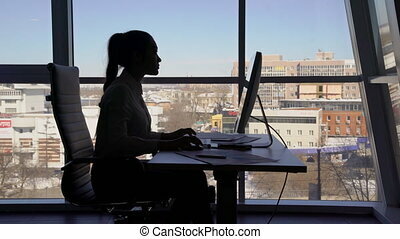 Business woman in front of Computer screen (graphic designer, freelancer, student or creative copywriter) working in her studio flat, loft or agency office. perfect workplace: shelves with folders, huge pro monitor, computer and other creative tools needed. She is looking closely at the monitor and watching what is happening on the screen. The work she is doing could be creative content for the company's advertising idea description, financial calculations or entering information data. Side view of Business Woman working in front of his monitor's computer Screen (graphic designer, freelancer, architect, student or creative copywriter) working in her studio flat, loft or agency office. She has a perfect workplace: shelves with folders, lamp, huge pro monitor, computer and other creative tools needed. She is working for many hours and looks tired. She is looking closely at the monitor and watching what is happening on the screen. Closeup of Business Woman working in front of his monitor's computer Screen. She is looking closely at the monitor and watching what is happening on the screen. 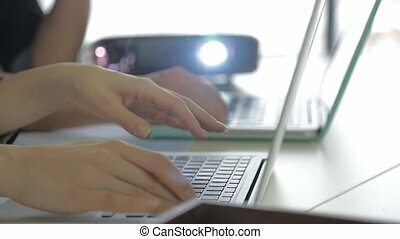 She also can be working online: network security, programming or communication in social networks. This is a perfect footage to illustrate themes like day in office, intensive working week, studio time or perfect employee. Also it is good with topics like new ideas, young professional or studying hard. Great Depth of field and bokeh. 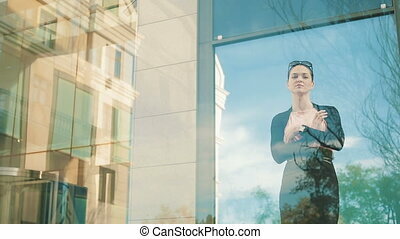 Women are discussing business issues in front of open window. 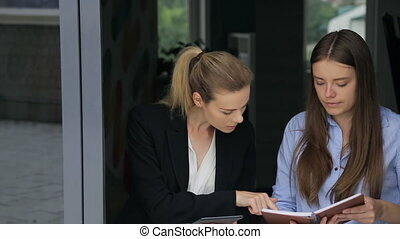 Standing in front of it in office corridor females are talking about new project and perspectives of company development making notes in notebook and tablet pc or consulting with documents, graphics or diagrams displayed on screen pointing important parts. Blonde woman with hair done in pony tail is wearing classic jacket or blazer with white blouse and woman with brown hair blue shirt. A man and a woman in, conduct business meetings, at a table against background of a large window. Three of them at table, a young man with tablet for papers tells a colleague new information relevant to their work. She listened carefully, looking at screen of your tablet and swiping it with his fingers, then takes pen and writes on a sheet of paper. Next to her sits another young employee, she does not behave actively, passively listening to everything and looking at table. 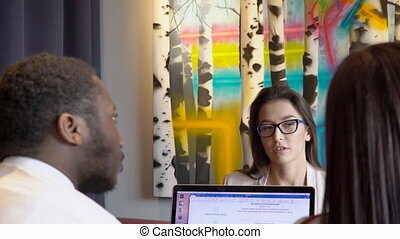 A man shows a woman colleague, graph of sales in office. They work by marketers, and in their sphere of work includes the study of tastes of buyers, product promotion, study of demand of products, market specific products and services, monitoring industry, organization of work of interviewers, processing of information using special computer programs, preparation of report with figures and graphs, comparative performance, predictive analysis, development of recommendations. Business Woman Architect drawing checks, measuring compasses (graphic designer, freelancer, architect, student or creative person) working in her studio flat, loft or agency office. She has a perfect workplace: shelves with folders, lamp, huge pro monitor, tablet, computer and other creative tools needed. She is working for hours and looks focused. She is a compass measures the distance in the drawing, and is compared with the testimony of the other section of the printed image. Translator girl sitting in front of the included microphone and translates from English into French, Arabic, German, Chinese and Russian. It had a wooden table on which a plurality of equipment, additional microphones, headphones, a separate large digital remote to control audio channels. rezhat next tablet from the head and dryness in the throat, the translation has been going on for several hours without stopping. 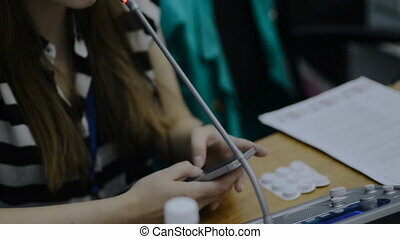 Translator girl sits in front of her simultaneous translation equipment, microphone in front of her and she is wearing headphones. For a long time she had already takes in this room, so it looks a little tired, however the microphone is always on and it surely translates from one language to another. We see how in the translation are not only thought, but uses a translator his hands. a true professional. Close-up view of woman filling form. Sitting at desk young business woman is writing report about working results or correcting documents, some important information for getting best result in company development. 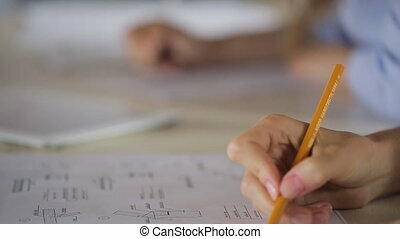 They are working out schedule or work plan according to standards pointing issues with pens or pencils. Workplace is messy with lots of object such as graphics and stationery lying on the top of wooden grey desk. 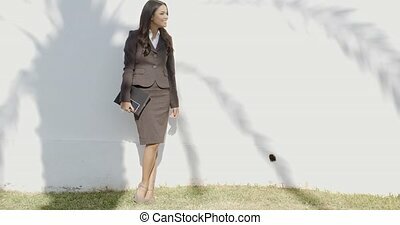 Two females are discussing business issues in office corridor. 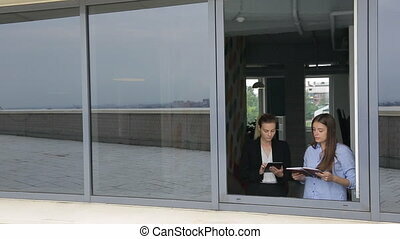 Standing in front of open window women are talking about currant rates, new project, perspectives of company development or economics making notes in notebook and tablet pc or consulting with documents, graphics or diagrams displayed on screen pointing important parts. Blonde woman with hair done in pony tail is wearing classic jacket or blazer with white blouse and brunette blue shirt. Beginning of working day in office, woman shows documents to employee, man puts his backpack on window sill. Through a square doorway of office furniture shows how a woman shows counterpart information on paper, and she leans over table to study it. Behind young woman brunette with long straight hair dressed in a blue shirt, man only came to his workplace and puts his personal belongings near window. Office space with windows blinds, desks with computers, it's a big firm. Woman accurately fastens silk lacing on foundation garnment of fiancee. She helps bride to prepare for wedding ceremony, one of most thrilling and important events in life of every female. Ties are so complicated but assistant succesfully copes with them. It is good tradition to ask mother or close friend for help during preparation for celebration of marriage. Special corset on bridal wearing apparel helps to create beautiful waist line. Business Woman working in front of her monitor's computer Screen. She is looking closely at the monitor and watching what is happening on the screen. 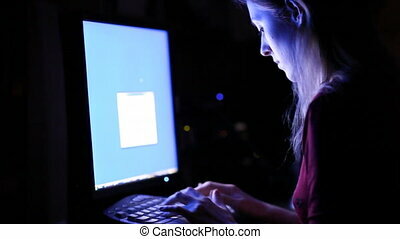 She also can be working online: network security, programming or communication in social networks. Closeup of Young man working at his studio loft and take some coffee in front of his monitor's computer. Great Depth of field and bokeh. 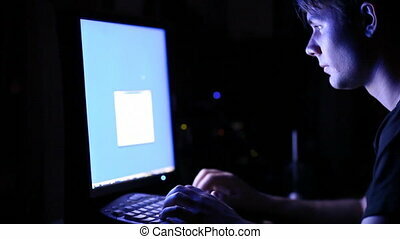 He sits in front of his computer near dark wood table desk. Probably he is an engineer or a student, designer or just a modern creative person. On the other hands he can be creating concept for project or web design, designing something associated with magazines or news articles. He looks very enthusiastic, interested and self-confident. Real professional. 14 second clip. 1920 x 1080 FullHD Resolution. Portrait Asian woman in office that solves problem in front of computer next to man. concept: two people, business office, serious work. 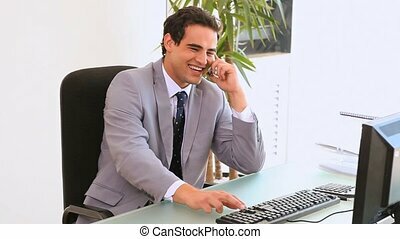 Business man is calling cellphone in front of employee. Sitting in office male boss is discussing important business issue interrupting working meeting with subordinate people waiting for him. He is wearing short black hair, classic jacket of grey color with golden decoration on lapel and sunglasses in pocket, sky blue shirt and jeans. Woman is continuing listen to him. Room is messy about lots of shelves, desks, chairs and colorful sofa on background. Woman in glasses says consultation to ethnic people in front of laptop. 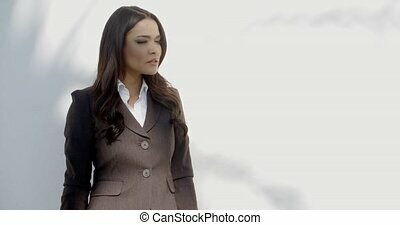 Man and woman of different nationalities sit in front of business lady and conduct explanations on an important topic. 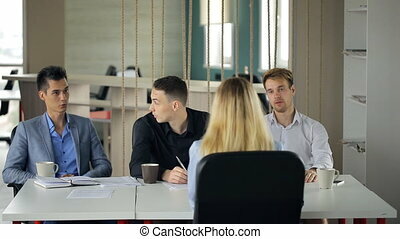 Young woman is having work interview in front of men. Sitting in office building at desk female is asked business questions trying to show her professional advantages and hide disadvantages for being hired as good worker, punctual, smart and perspective employee who can solve problems and develop company with co-working people. She is wearing long loose blonde hair and blue long-sleeved classic shirt. Males are wearing suits being concentrated and interested. 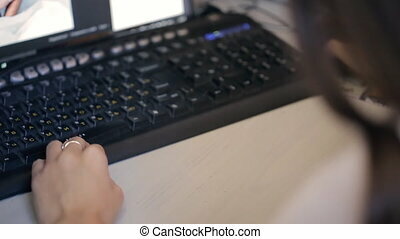 Black keybord in front of monitor with one woman hand. There is view from persons back on standard keypad with yellow Russian letters, white English alphabet, grey special buttons on top. It is on light wooden table near screen. We see only part of it with changing picture. On left side there is arm of young woman or girl with gold ring. Also in right corner of video there is some part of lady with dark hair. 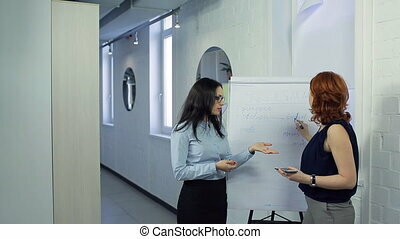 Woman teaches her colleague SMM, SEO in front of board. 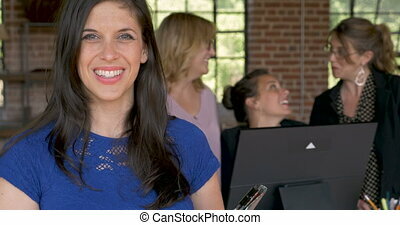 We see attractive slim lady with long dark hair, nice manicure, in light blue shirt, grease skirt, big modern glasses. She explain something to woman with short red hairstyle, many silver rings, watches, necklace, earnings with diamonds in denim top, grey trousers. Listener holds mobile phone to record speech and marker to mark main thoughts on sheets of paper on chipboard behind. They are in office with white walls. 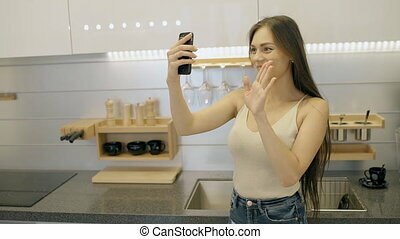 American woman talks in front of gadget with smile in lighting room, stylish young businesswoman wearing casual looks at phone screen standing in home kitchen interior. Concept: social media, connectivity, enjoy time. 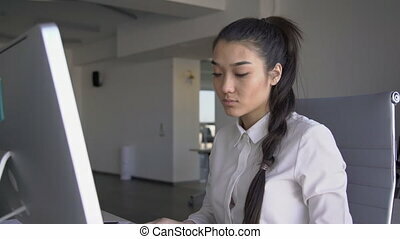 4k Portrait of beautiful business woman is working, sitting at table with computer in finance company, looking at monitor, typing text, touching face. 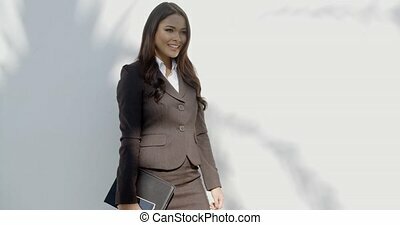 Confident brunette with pigtail wears stylish formal clothes. Concept: planning, successful lady, technology. Young beautiful woman doing deadlift in front of mirror in gym. Attractive redheaded sportswoman in black training suit with green parts on back, colorful snickers with funny patterns, with tattoo on hand hold bar without weight plate in fitness club. Female put her feet about hip-width apart, lean with her back straight, unbend. In reflection she monitor correctness of exercise. This workout with barbell training muscles of hamstrings, refer to strength type.